I blame Greyhawk Grognard of course. There was a lot of words. I mean a lot of words. 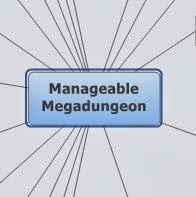 Then I decided this may be a shade ironic given this was about making megadungeons manageable. So I thought... mindmap? Plus I had to give XMind 2013 a spin. Or if you prefer, XMind 2013. There are numerous lists out there (some included) but keeping track of it all is a challenge. For those less able to speed-read, this may be some help. Please provide feedback in the usual location!